Takena Nagao has done it again. For those who are familiar with his work, you can expect the same high quality stop-motion, claymation, no dialogue, and lots of blood and gory kills. Two girls wearing bunny suits get involved with a creepy male, who turns outs to be some alien with a wide mouth and long tongue. The bunny girls decide to solve things in a “quick and effective” manner. By slicing and dicing them with a chainsaw. Amazing stop-motion, claymation, especially during the gory fight scenes when the movements are fast and on-point. The backgrounds are simple and lack much details. The male characters are creepy, especially their facial expressions when all they do stare without blinking and smile. The female are no different, but at least they blink their eyes, make angry or shocked facial expressions, and not smile like an idiot. There is no dialogue. There are no opening and ending songs. There are however many detailed sound effects, such as people walking, doors opening, chairs sliding, knife stabbings, and a chainsaw roaring and spinning. The background music is there to provide the viewers what type mood is happening. What is character development? What is background stories? There aren’t any here. Just two bunny girls, many creepy males, and one chainsaw. The chainsaw is the best character, it solves many problems. 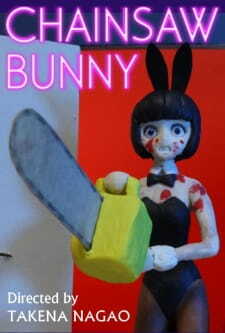 I expected blood and gory, and I got blood and gory, plus a bunny girl wielding a chainsaw makes everything better.